Reed alumni spanning five decades descended on Cerf amphitheatre last week for Fanfayre Friday, the start of weekend festivities for Reunions '14: Reedfayre, June 4-8. The mood was festive (possibly more than usual because the signature cocktail known as Plato’s Punch swirled among the celebrants). Greg Byshenk ’89, president of the alumni board of directors, took the microphone and bid people find their seats. From the start, he set the theme of Fanfayre as one of gratitude, thanking the volunteers and class leaders who had come together to organize Reunions. 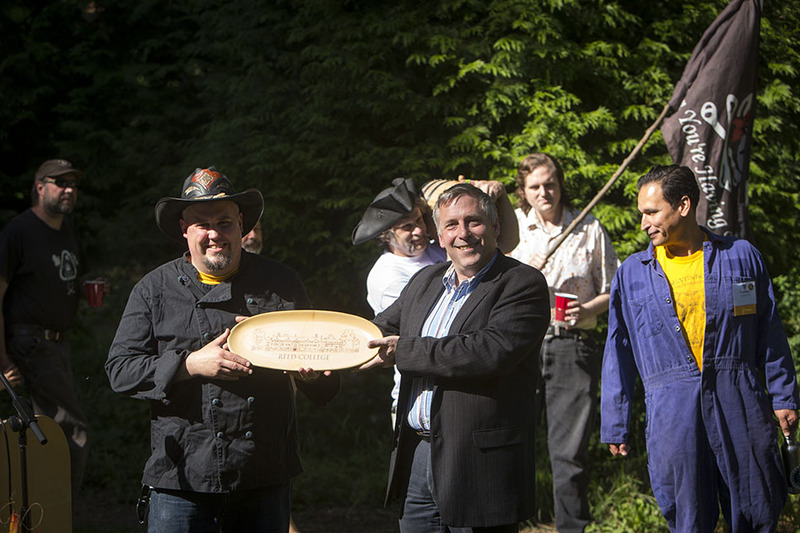 The Babson Society Outstanding Volunteer Award was presented to Reed's own Meat Smoke Crew, the alumni group that has been hosting Renn Fayre feasts since 1985. Accepting the award on behalf of the crew, Andy McLain ’92 extoled the value of alumni-student interaction. Meat Smoke, he said, offered students the “comfort of a warm fire and the likelihood of a warm morsel.” Based on his experience, he reassured alumni that Reed students have not changed. “The kids are alright, I promise,” he said. Fanfayre also honored retiring faculty. As he presented commemorative ceramic bowls to faculty members, Byshenk read tributes from their former students. Prof. Kathleen Worley [theatre 1985–2014] said that she worked with wonderful students each year of her teaching. Prof. Ron McClard [chemistry 1984–2014] was unable to be present. In addition, Robert J. Palladino [calligraphy 1969–84] was welcomed as an honorary alumnus.